You'd think that now that school's out and most practices are over for the season, that I'd be able to get out there and run every day. But noooooo! Everyday it's something: graduation activities, weather or just pure laziness on my part. I've got to get more consistent. Consistency would be good on the cooking front as well. In the past couple of weeks or so we've gone out to eat more than we've eaten at home. Pizza, Subway, fast food. ::sigh:: More consistent and more organized would be good. This lack of computer access is killing me! I normally surf the web looking for yummy recipes to make for dinner as I drink my morning tea. My day is then planned out. I know if I need to hit the store and when I need to start dinner. Without my computer, I'm lost!!!! We love pasta around here and this one was destined to be a winner. 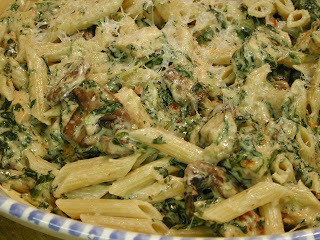 Chocked full of delicious, meaty portabella mushrooms, spinach and sun-dried tomatoes, it has to be good!. Mmmmm! Coat chicken breasts with olive oil and black pepper. Grill chicken breast 8 to 10 minutes, turning once until done. Cool slightly and cut into bite-sized cubes. In sauté skillet, heat olive oil over medium heat until hot. Add Portabella mushrooms, tomatoes, spinach, garlic and chicken. Sauté until mushrooms begin to soften. Add Alfredo sauce and Penne pasta. Cook until all ingredients are hot. Divide into 2 pasta bowls and garnish with fresh Parmesan cheese.